The characteristic of comprehensive tolerance to differences in belief and Hinduism's dogmatic openness makes it difficult to define it as a religion according to the traditional Western conceptions. While Hinduism is a clear practical concept to the majority of adherents, many expressed a problem arriving at a definition of the term, mainly because of the wide range of traditions and ideas incorporated or covered by it. While sometimes referred to as a religion, it is more often defined as a religious tradition. It is therefore described as both the oldest of the world's religions and most diverse in religious traditions. Most Hindu traditions revere a body of religious or sacred literature, the Vedas, although there are exceptions to it. Some religious traditions regard certain particular rituals as essential for salvation, but a variety of views on it coexist. Hinduism is sometimes characterized with the belief in reincarnation (samsara) determined by the law of karma, and that salvation is freedom from this cycle of repeated birth and death. However other religions of the region, such as Buddhism and Jainism, also believe in this, outside of the scope of Hinduism. Hinduism is therefore viewed as the most complex of all the living, historical world religions. Despite its complexity Hinduism is not only one of the numerically largest, but also the oldest living major tradition on earth, with roots reaching back into the prehistory. A definition of Hinduism, given by the first Vice President of India and prominent theologian, Sarvepalli Radhakrishnan states that it is not "just a faith", but in itself related to the union of reason and intuition. He explicitly suggests, that it can not be defined, but is only to be experienced. Similarly some academics are suggesting that Hinduism can be seen as a category with "fuzzy edges", rather than a well defined and rigid entity. Some forms of religious expression are central to Hinduism, while others are not as central but still within the category. Hinduism has been perceived as one of the world religions we know today only since the 19th century, That was when the term 'Hindu-ism' started being used by leaders of Hindu reform movements or revivalists. This is often considered to be a biased, Western orientalists or the "first Indologists" viewpoint. However it is clearly accepted that sources of Hinduism and the "streams" which feed in to it are very ancient, extending back to the Indus Valley civilization and earliest expressions of historical Vedic religion. It is not an accepted view that Hinduism is the construction of Western orientalists to make sense of the plurality of religious phenomena originating and based on the Vedic traditions, however some have suggested it is. Problems with the single definition or of what is actually meant by the term 'Hinduism' are often attributed to the fact that Hinduism does not have a single or common historical founder. The forms of Vedic religion are seen, not as an alternative to Hinduism but as its earliest form, and there is little justification for the divisions found in much western scholarly writing between Vedism, Brahmanism, and Hinduism. Some suggest that Hinduism does not have a "unified system of belief encoded in declaration of faith or a creed". It is therefore a very different kind of religion in these respects to the monolithic tradition of Islam, while some suggest there are stronger affinities with the structure of Judaism. From the western point of view, the understanding of Hinduism was mediated by Western notions of what religion is and how it relates to more ancient forms of belief. It is further complicated by the frequent use of the term "faith" as a synonym for "religion". Some academics and many practitioners refer to Hinduism with a native definition, as 'Sanatana Dharma', a Sanskrit phrase meaning "the eternal law" or "eternal way". I want to go to Heaven! Judaism? Buddhism? Hinduism? Christianity? Islam? The famous psychologist Carl Jung (CJ Jung Institute of Zurich and New York) was quoted as saying that he never had a patient, man or woman, over 40 whose problems did not root-back to fear of approaching death. Through my readings and study and conversations, the very worst fears of humankind are death and eternal lostness. It is not "where we came from" or "why we are here," it is the absolute fear of dying, and not going to Heaven. The attractive aspect of this book is that it is succinct. It gets to the core issues, the key questions. You do not have to read the whole library to understand the differences among the major religions. The majority of people do not ever attend either Church or Temple or Mosque or Synagogue, but they still think, and worry, about this stuff, this subject. Why? The book has an understandable answer to this understandable question. 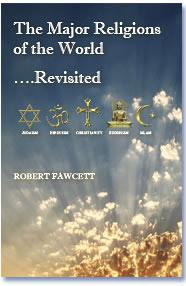 Further, this book makes it simple: it asks the same questions of each religion as to its beliefs and teachings. What do they teach as to a Creator? The origin of the universe, our planet Earth? The origin of evil and suffering? Each religion's role, their purpose? To take the next step, order our book.